Pitchview offers you a modern and efficient way to capture trade fair contacts, coordinate your team and reach potential customers through digital channels. Capture new contacts quickly and easily with the integrated business card scanner and our customized lead forms. Create customized contact forms and secure valuable information according to GDPR guidelines. 30% of all contracts are awarded to companies that are the first to get in touch with the potential customers after the first interaction. 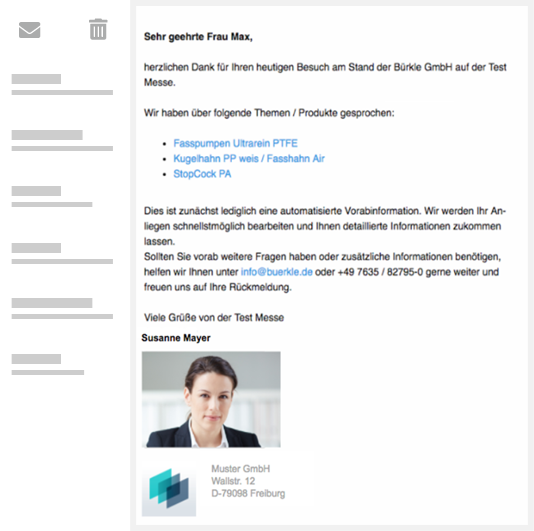 With Pitchview you can send individualized thank you emails directly from the exhibition stand, including personalized marketing materials. LinkedIN and XING profiles of your potential customers will be found automatically, so that you can link them directly to your contacts in social medias. Remind visitors from a trade fair about yourself via remarketing campaigns on a third-party websites. 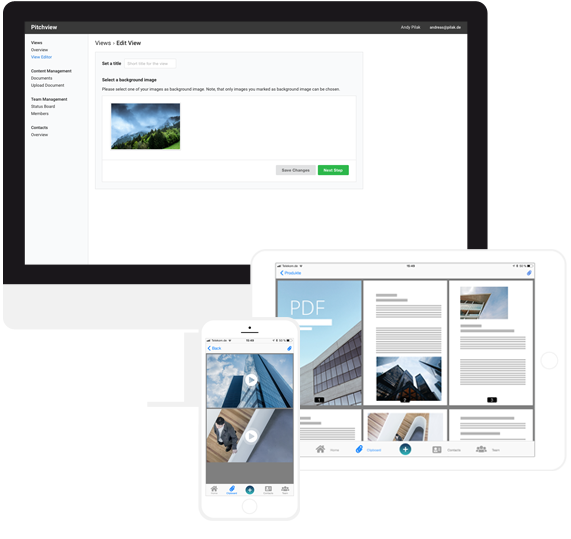 With Pitchview your sales team always has quick access to all relevant marketing materials such as presentations, videos, price lists or CAD files and can easily share this content with the potential customers directly via the app. The documents are managed centrally and are always up-to-dated on each device. Colleagues at the stand can login and logout with 3 clicks. Both the information desk and all colleagues have a full information regarding the availability of the entire trade fair team in real time. 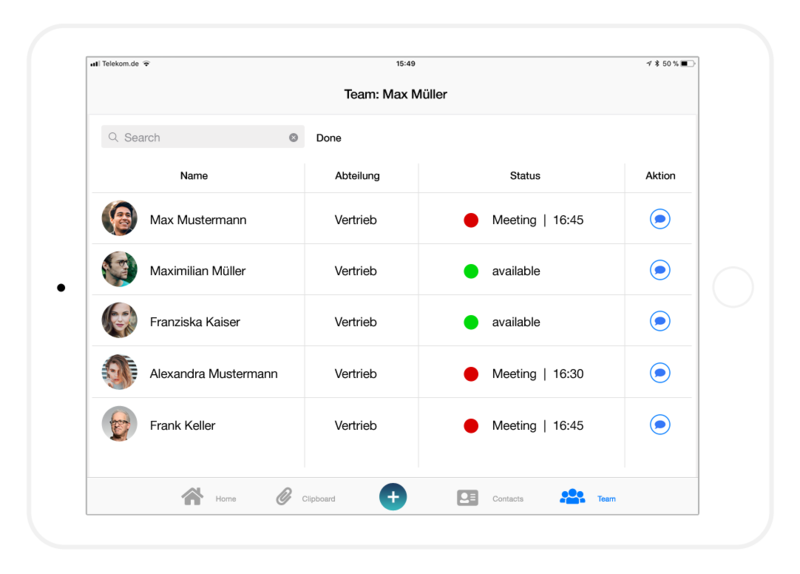 The entire team can coordinate themselves directly from the pitchview apps via SMS, push notification and telephone call. Data, recorded at the trade fair, can be transferred to numerous CRM systems via the export module, allowing your marketing team to follow up captured contacts straight after the trade fair. With the integrated system of documents management, catalogues, price lists, product description sheets and videos (also offline) can be displayed on the tablet at any moment. As a result, employees are much more flexible and can give presentations or capture contact data outside of their own stand. Pitchview is designed for usage at international trade shows. The app is multilingual, recognizes up to 16 languages (also Mandarin or Russian) and automatically sends thank you emails in any number of languages. Pitchview can be connected to the database of the trade show via APIs. By scanning a QR code on a visitor's badge, contact data can be easily captured in Pitchview. Pitchview is equipped with numerous security features. If, for example, device is missing, it can be blocked directly in the back end. Your customer data will be stored in a high security data center in Germany.